HELP WITH HELMET SOUND SYSTEM ! 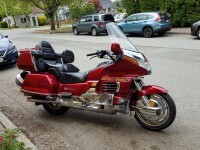 We have only been Goldwing Riders for about three years so there is still SO MUCH WE DON'T KNOW. 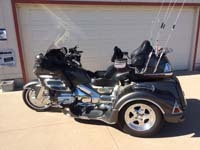 Our ride is a 1995 GL 1500 SE with a Roadsmith Trike conversion. We live in Southwest Utah, 3 hours closer to Las Vegas than to Salt Lake City. My wife and I just returned from a ride to San Francisco, six out of ten days on the trike, four of which over very hot desert pavements. I should mention that our 95 1500 SE has a particularly loud exhaust system, and we attempted to reduced the noise level with the addition of a resonator between the stock muffler (with baffles removed by previous owner) and the exhaust tips; the resonator did not make much difference. This trip determined us that we need to replace our older, open-face helmets to try to REDUCE THE WIND AND EXHAUST NOISE and get a new SOUND SYSTEM. On the way back we stopped in the large cycle shop in Las Vegas and spent several hours there, ending up more confused than ever by all the options. We think we need a SOUND SYSTEM that provides 1) clear INTERCOM communication between passenger and driver over wind noise and static; 2) ability to LISTEN TO THE RADIO (both on-board and SIRIUS) 3) listen to MUSIC from our CELL PHONE & MP3 (Blue Tooth) 4) utilize the ON-BOARD CB SYSTEM. Being able to communicate with other riders in a group would be nice, but at this point is not essential to us. We also are not particularly interested in being able to take or make phone calls while we ride. WE ARE OLDER and not particularly tech-savvy, and have already been defeated (at least temporarily) by UCLEAR; in Las Vegas we bought a SENA 20 S EVO (quite expensive for us), and listened closely for a long period of instruction on how to use it, and experienced miserable performance with it in our new SEDICI Modular helmets. The SENA seemed to work okay at lower speeds, but at highway speeds the sound was weak and distorted. I was an Educator for 45 years, and maybe that's the reason I am neither fond of nor very good at pouring over long technical directions. This whole HELMET SOUND SYSTEM quandary seems so huge it could become a second career! IS THERE ANYONE OUT THERE WHO CAN GIVE US A FEW REALLY GOOD CUT-TO-THE-CHASE RECOMMENDATIONS ON HOW T0 OVERCOME THE WIND AND EXHAUST NOISE AND HAVE GOOD CONVERSATION, RADIO AND MUSIC IN OUR HELMETS? We would be SOOOO grateful. Re: HELP WITH HELMET SOUND SYSTEM ! I have a tough time trying to resolve your "Radio/Stereo" issues because I have no experience with your year model. I just swapped out the OEM radio on my '91 Interstate and it works great, (minus the CB capability you mention). That Sena 20-S should work great for all your intercom/bluetooth/music needs, , ,so it seems that the crux of your problem is that the HELMETS are not blocking the road/exhaust noise at freeway speeds. Your neck of the woods can get a good deal of HOT and COLD weather so, if it were me, , , I would consider a "modular" helmet (the ones that have a "flip-up chin bar"). The "Full-face" helmets are alleged to block wind noise better than "modulars", but since you can't "flip-up" a full-face helmet, they can be hotter on your noggin. Once you decide on whether you want a full-face, or a modular, ,I would recommend checking out the Sharp Labs rating website and look at the highest rated/lowest cost brand and model. The most expensive helmets are NOT always the safest. You'll find a lot of "certified" ratings on the internet, , (DOT, Snell, ECE, and a few others) but the Sharp Labs rating/testing is VERY impressive and since they aren't seeking any sort of "approval" for their findings, I consider them to be a good source of "NEUTRAL" but reliable information on safety/testing issues. I've recently been involved in the search for a new helmet to replace my 15-20 yr old Nolan. My research led me to the HJC IS-Max II Elemental MC-3H as my choice, , but I do not recommend that you read this and make the same decision without investigating all the information you can glean from whats out there. A modular helmet, or full-face, with a good chin curtain that fits properly, and good "seal" would greatly improve your experience for sure. Thanks very much, bluthunder31, for your time and consideration in sharing your experience. thanks especially for your viewpoint on Modular vs. Full Face. Our ride last week back from Las Vegas with our first Modular helmets revealed that until we got up into some elevation later in the evening, with the cover in down position we felt like we were breathing inside an oven; we had to flip those covers up to catch our breath! Thank also very much for the Sharp Labs website link. We will check it out. One thing we are not clear on is what you mean when you wrote of ...."swapping out the OEM radio on your '91 I ... and it works great". What was the "swap" and what worked great? Do you mean you took out the old OEM radio and installed a new OEM radio, same model, etc.? Thanks again, friend. Not many have accused me of being "shy" about giving my .02 cents on most topics, (haha). I hope my viewpoint helps. My old '91 was made with a crappy little AM/FM stereo in the left fairing pocket, that was not very good even when it was brand new. Just recently, I removed the old 27 yr old OEM radio and replaced it with a new "aftermarket" stereo (bluetooth/aux in-put/USB/remote control(for mama ofcourse)) for $20 and mounted it face up on the center-shelter. I upgraded to new speakers too, so the improvement was stunning. The process I used, along with a few pictures of the finished product, are on this site under one of the "radio" threads, but your setup is a bit different from my old Interstate. Good luck and hope to see you someday on the road. I have a Shoei modular helmet and when I get too warm, I pop up the front face shield a little bit to get some air underneath. Something else that I have done, is to change the windshield out to a Madstad that is adjustable to meet current weather conditions. Always before, I have had tall windshields, the +4 types, in Tulsa Tall, and Optic Armor. 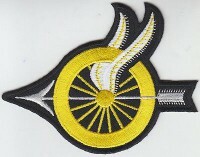 Both of those types prevent any wind at all striking your helmet, at any portion of it. opening up the vents on top did nothing. this past weekend, I took my first long trip with the new Madstad and was amazed at how well those helmet vents actually work. I was able to keep the faceshield closed and could actually feel the air circulation around the top of my head with the Madstad lowered down to below eyeline level. this allowed the air stream to strike my helmet just above the faceshield. makes a lot of difference in how well our helmets work. I will only wear a Modular, because I wear glasses and a full face will strip your glasses of your face when putting it on, or taking it off. as for hearing the speakers, you need good loud ones, and quiet helmet. It sounds like you're looking to do pretty much exactly what I have done on my bike, and for the same reasons. I have installed an AUX IN on my radio (I did it myself, but Sierra Electronics will do it if you are not handy with a soldering iron). I use this to listen to my satellite radio. I have hard-wired J&M Elite headsets in my helmets. They are reliable, sound very good, and have excellent microphones. I ride wearing custom fitted earplugs (although regular foam earplugs will work - just not as comfortable or effective). These block most of the exhaust and wind noise. I can still hear the engine and traffic around me. I have the volume of the radio set so that I can hear it clearly through the earplugs. I've been riding for many years this way, and it works very well - no noise fatigue, and clear audio. The headsets let me communicate over the intercom and the CB. If I could change one thing, I would make the intercom voice activated, instead of the microphone being open all the time. If that really bothers you, you can install Mic-Mutes, which will allow you to do this manually. I also have a GPS Input that lets me hear my GPS spoken instructions over my intercom. Had similar probs. Answer was good old fashioned hard wire system. No I can't talk to other riders etc but not a problem. I ride alone with the wife.. All communication radio and GPS etc goes through my Autocom box mounted under the seat. Job done. Good luck Timbom62@gmail.com . I have the EdSets which are fantastic. At highway speed I can talk with open face and others can hear me clearly. I have a modular Nolan N4 so usually have it closed. The hearing is also fantastic. The EdSets have an actual microphone, much as used on helicopters. Many microphones are only a small speaker. Yes, you can talk through a speaker but it isn't very clear. If the EdSets are installed correctly you should have no problem. I can use the radio, CB, aux, and com. I hope this helps in your decision making. I would offer a suggestion which I did not see during this posting. Put extra effort into the placement of your speakers inside your helmet! I also purchased the J&M Elite helmet system with speakers, microphone and wiring, etc. I self-installed the equipment, turned everything on and was immediately disappointed with a lack of volume and I wasn't even moving. 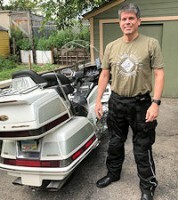 To my credit, I had plugged in the system prior to tearing into my helmet and found it to have great volume and the best sound I had ever heard from a small helmet speaker. I then installed it with the poor results. I double checked many things but the only thing I had remaining was the actual position of the speakers as they sit inside my helmet. I had to do some custom cutting and shaping of the ear cut-out spaces and allowing room for additional movement, I tried again with better "center of ear" position and AHAA, success. Seriously, this was an entirely new world of sound and clarity. They have worked in all conditions and highway speeds for several years. - Closeness of the speaker to your ear. These speakers need to be close-coupled to your ear, so get them as close as physically possible - but without actually touching your ears (which will cause painful hot spots after an hour or so). If they are not close, you will end up with a tinny sound, with no bass. - Sealing of the back of the speaker. Make sure when installed, the back of the speaker is not open to the same space as the front of the speaker. Seal it well so that air (i.e. sound) from the back of the speaker cannot mix with sound from the front of the speaker. Doing so will enhance the overall sound quality and bass response. Placement of speakers is critical as well as the microphone. Always be sure it is turned toward you. Sometime the speaker get turned outward and then no one can hear you. I purchased a Sena Freewire, and a Sena 20S Evo, and the local dealer (Cycle Gear) helped me with install. Everything was checked out and working before I departed the store. I can now listen to my on board CB, Radio, Weather station, Cell Phone with calling capability, and an Aux unit of my choice. It was a bit costly, but with my Military discount was affordable. As soon as I talk my buddies into getting the 20S Evo, we will be able to talk between riders, up to 8 can connect at a time. So I'm now a happy rider. I also moved the front 5 Pin Jack inside the left cubby hole of a box on the Gold Wing, and nothing is showing, that was a very easy fix. What ever you purchase, make sure that the dealer helps install, and that you are happy before you leave the store, if not don't purchase, I've wasted way too much money on items I was unhappy with, no more! Wish I had all my money back, I would be rich today, LOL. Rockdog: Thanks very much for taking the time to let us know about your experience; it is all particularly relevant because your experience has been with the very same brand names that we have been struggling with ...... er ..... trying out ! We appreciate all your info about helmet fit and how to handle the "heat" at slower speeds and stops ..... and alignment of speakers to the ears, so much we are still working on to get right. We never encountered Scorpion helmets at all in our shopping. Too bad. I know the Sedici that your wife chose to keep is a modular helmet, but is your Scorpion a modular or a full-face? What is your take on those super expensive (to us) Shoei helmets. They did seem to be the most comfortable just putting them on in the store .... but oh, that $700 price! We would also really appreciate knowing more about why you chose the Sena 20 over the Sena 10, and if you also purchased that additional "box" (I can't ever remember the name of it)) that costs about $250 and somehow integrates the wireless system in your helmet with the wired system built into the bike. Do you use your CB radio through the SENA 20 ? And does the "multi-task" or "mesh" function work well, where the music is supposed to "dim" itself automatically when you start talking? 'Sorry to ask you so many more questions, but we really appreciate your help. My wife and I ride with Arai open face helmets with the wired J&M Elite headsets installed. The sound is great, but the addition of ear plugs makes a HUGE difference! They cut the road and wind noise drastically, while still allowing music and conversation. Give it a try. It's a very inexpensive fix as compared to replacing the sound system. The last two Arai helmets that I have bought had pockets already cut out in the EPS inner layer for speakers. You just remove the cover for the side piece, pull the pre-cut piece of soft foam away, put the speaker in, put the cover back on, and it's done - and correctly positioned. I just put the Sena 20s evo in my helmets, I like the fact they are wireless and go with you and are not tethered to the motorcycle. It snycs to our cell phones so we can both listen to music at the same time we have communication between rider and passenger and we can pick up calls with the touch of a button! It also has a FM radio function I like as well! Thanks for your input, prtfndr. It came at a good time, as we have been wavering about turning in our Sena 20s and getting the Sena 10s. The SENA 20s seem kind of complicated to operate.